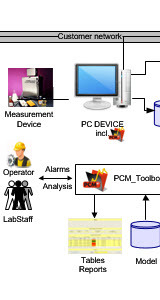 The PCM_Toolbox (PCM = Process Chemometric Methods) is a dedicated software package for the analysis of chemical reaction data, instrument standardization, and classification of material quality. It has many applications in Process Analytical Technology (PAT) in instrument suppliers as well as cement, chemicals, biotechnology, medicine and food-processing businesses. The software works on the basis of spectral measurements or images (XRF, XRD, grading curve, FTIR, NIR, UV / VIS, Raman, NMR, OES, GC On-line, at-line HPLC) and / or physical measurements (T , p, pH, feed rate, heat flow, pO2, CER, OUR). Please contact us for more detailed description.